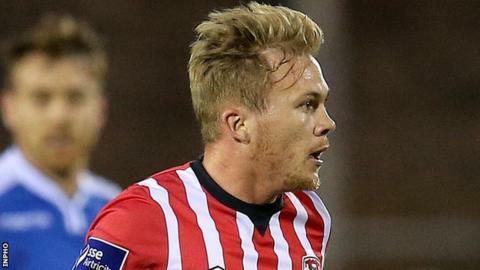 Rory Patterson's last-gasp goal earned Derry City a 2-1 win over Wexford Youths as the Candystripes moved level on points with leaders Dundalk. Conor McCormack's superb 25-yard effort put Derry ahead on 69 minutes but Wexford looked to have snatched a point when Danny Furlong levelled on 82. However, Patterson headed a Barry McNamee cross to the net in the final minute of injury-time. The win gave Kenny Shiels' Derry side their fourth straight victory. With the conditions making constructive play very difficult, Wexford had the better of the first half with Gerard Doherty having to make a smart save to deny Furlong. However, Derry had the wind advantage in the second period and they began to cause the home side problems. McCormack's brilliant shot put the Candystripes ahead on 69 minutes and Patterson wasted a chance to double the advantage four minutes later when he fired straight at Wexford keeper Graham Doyle. Wexford looked to have snatched a point as Furlong pounced after a mix-up in the Derry defence but in-form Patterson had other ideas as he headed in the dramatic winner in the final play of the game.